When it comes to your little one and dental anxiety, our pediatric dental office in Long Island is ready to go to battle and help conquer their fears to ensure that their visit to our office is always comfortable — never scary. We know children can feel uneasy because of various sounds and sights that come with seeing the dentist. It’s always our mission to make sure kids are treated gently and with compassion. Our Long Island pediatric dental office knows the importance of helping little ones feel at ease. Very small patients can sometimes have a hard time sitting still during procedures that might be more time consuming and require additional precision. Sedation can help make the visit less stressful for both child and parent, creating a happier visit and a much more pleasant experience. It’s beneficial for patients with special needs too! While both sedation and general anesthesia have wonderful results at helping children receive the dental care they need, they are actually quite different in both desired effects and administration. General anesthesia is helpful when a youngster must undergo a more in-depth procedure because it relies on a sleepy, unconscious state. But dental sedation is solely intended to reduce anxiety and any addition discomfort during a visit to the dentist’s office. The effects are usually marked drowsiness that ends shortly after treatment is complete. Your pediatric dentist in Long Island is always here to help address your questions and concerns when it comes to helping your youngster have a positive dental experience. We always do our very best to ensure they’re comfortable and feeling safe. Please know that if, for whatever reason, sedation become necessary for your child it can be used safely and effectively following the guidelines of the American Academy of Pediatric Dentistry. It’s always a good idea to talk to your dentist about what options may work best to suit your child’s needs. Going to see the dentist should always be a positive experience for everyone. After all, we want to see your little one smile, be happy, and look their very best. No matter what type of treatment your child needs, we never want their experience to be frightening or fearful. Please know that we are always here to help! 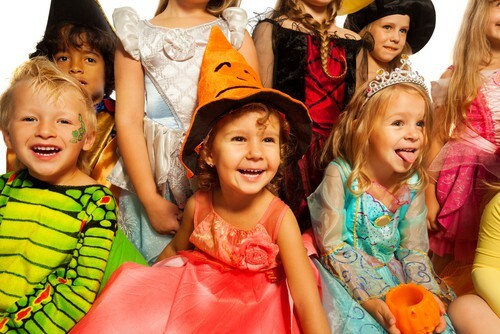 At our pediatric dental office in Long Island, we know how much fun Halloween can be. The costumes. The parties. The chills. The thrills. It’s also the time of year when an abundance of sweet treats are available and tempting to young teeth. When trick-or-treating leads to heaps of unhealthy candy, it might be a good idea to dole out the treats in moderation. Our Long Island pediatric dental office, recommends that you try limiting your little one with a piece or two with meals, instead of letting them have free reign whenever they want one. Now that’s a sweet idea! Your Long Island pediatric dentist wants you and your little ones to have a great Halloween. By following some or all of these helpful tips, you can limit the amount of sweet treats your kids eat and reduce the risk of cavities. Always remember to keep little teeth healthy by brushing and flossing each and every day. We hope you have a safe and Happy Halloween! Your kids work hard at school, and a lot of the time they come home hungry. But it’s not quite time for dinner… so you search the pantry for a snack to hold their growling tummies over. Snack options for kids can vary in nutritional quality and not all are created equal when it comes to oral health. Let our Long Island pediatric dental office help making snacking decisions easy with our guide to healthy choices for little smiles. Is it exposed to the mouth for a long period of time? If the answer is no to all of the above, there’s a good chance it’s a safe bet. Foods that are packed with sugar aren’t the best choice. Those with sugar and a sticky texture are worse. And snacks that are sugary, sticky, and in the mouth for awhile are ones to stay clear of. Stock up on some of the following foods for happy kids and happy mouths. Cheese – A stick of cheese can lower the mouth’s pH and decrease the chance for decay. Almonds – Packed with calcium, almonds are great for bone health. Carrots – Like apples, the crunch of carrots helps scrub teeth clean. Carrots are also a great source of fiber and vitamin A.
Celery – Another crunchy option, celery provides a healthy combo of vitamin A and C, both of which are antioxidants that can boost health. Besides helping your kids make smart choices about their snacks, you can really help keep their mouths healthy by practicing good oral health habits like brushing and flossing daily. Make sure they’re getting a thorough cleaning by setting a timer for two minutes and let them brush until it dings. It’s also important for them to visit their pediatric dentist in Long Island at least twice a year. These visits can catch any problems early and it’s a great time to take advantage of preventive dentistry treatments like sealants and fluoride. If your child is in need of a dentist, call our pediatric dental office in Long Island to schedule an appointment. It’s important to note that gluten negatively affects the teeth of those who have celiac disease or other form of gluten sensitivity, but it does not affect those who do not have a gluten sensitivity. Everyone at our pediatric dental office in Long Island encourages you to speak with a physician before switching your child’s diet, or your own. 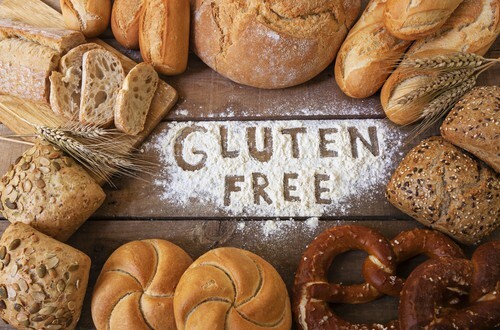 Sometimes signs and symptoms of celiac disease don’t show right away in the gastrointestinal tract, which is usually the norm. Instead, they show in the mouth first. To make sure your child’s teeth are protected, even he doesn’t have celiac disease or a gluten intolerance, it’s important that he visits our Long Island pediatric dental office regularly so we can monitor any potential problems. Gum disease is a serious oral health concern that affects nearly half of all Americans. While it’s typically more common in older adults (as high as 70% in those over 65), at our pediatric dental office in Long Island, we want all of our patients to know that gum disease can also occur in children. If you notice any of these symptoms, contact your pediatric dentist in Long Island as soon as possible to schedule a thorough exam. If you suspect your child may have gum disease, give our Long Island pediatric dental office a call. We’ll schedule an appointment as soon as possible, perform a comprehensive exam, and discuss any findings with you to determine the best treatment available. Welcoming new patients from Long Island, Westbury, Nassau County. The dental office can be a scary place for kids. For those with special needs, it can be terrifying. As a parent, you never want your child to go through anything that makes them feel scared or nervous, but you do want to do everything you can to keep your child healthy. So what do you do when they’re frightened to go somewhere that’s necessary for their wellbeing? Our pediatric dental office in Long Island can help you make the right decision for your child’s oral health care. 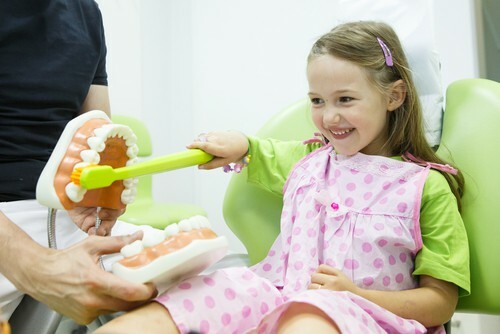 What is Special Needs Pediatric Dentistry? Children with special health care needs (SHCN) need to see a dentist just as regularly as everyone else. But in order to get the best, most appropriate care possible, they should go to a dentist that’s trained to meet their advanced needs. 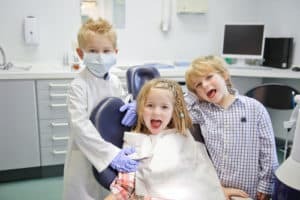 Pediatric dentists in specific are required to complete two or more years of additional education beyond dental school to learn advanced techniques on the differences between treating adolescent patients and adult patients. They’re also trained in behavior management and sedation to help get children the care they need. Often this training includes how to treat those with special needs. Ideally your child will see one of those dentists that has advanced education and experience on working with special needs children. You should look for a dentist that specifically says they’re trained to treat SHCN patients. Most importantly, you should choose one who makes your child feel as comfortable as possible, and who makes you comfortable too. At our Long Island pediatric dental office, we’re here to take care of little smiles of all kind, including our most special patients. If you’re looking for a dentist who can help your child with special needs get and keep a healthy mouth, give us a call to schedule an appointment. Almost all of us have experienced a toothache, so we know how uncomfortable the pain can be for adults. But when a toothache happens to a child, it’s a different story. The parent side of us wants to make the pain go away as soon possible and tries to make our children understand. But it’s not always an easy thing to do. At our Long Island pediatric dental office, we’re always happy to help relieve toothache pain. But if your child gets a toothache when we aren’t open or even while you’re away on vacation, there are some tips you can try to help ease the pain. Salt Water: If your child is old enough, have him rinse with warm salt water Mix a cup of warm water with a tablespoon of salt and have him swish it around in his mouth. The mixture can actually pull the fluid away from the affected area and reduce pressure on the nerve endings. Stress to him to spit it out and not to swallow it. You can repeat as needed. Cold Compress: Gently holding a mushy cold compress to the outside of the mouth where it hurts can also relieve swelling. Do not place the cold pack directly on the skin. Instead, wrap it in a towel. Anti-Inflammatories: Giving your child an age-appropriate anti-inflammatory medicine may also help him feel a bit better. Clove oil may also work. Clove oil is a natural analgesic and has antimicrobial properties. All you need to do is soak a cotton swab with 2-3 drops and gently dab it on the area that hurts. Oftentimes toothaches are caused by a cavity or infection. While we can’t guarantee these won’t happen to your child, we can tell you with absolute certainty that regular pediatric dental cleanings and exams can help minimize the risk. Pair appointments at least every six months with proper at-home oral hygiene of brushing twice a day for at least two minutes and flossing once a day for best defense against toothaches. 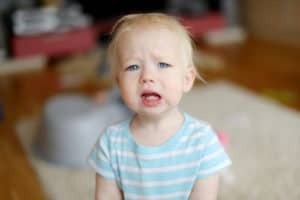 Although these few tricks may help ease your child’s pain, it’s important to know that a toothache is the mouth’s way of saying that something isn’t right. It’s never wise to assume that easing the pain is enough. In its early stages, a toothache could be the result of a minor dental problem that’s easily fixed by your Long Island pediatric dentist. If let go, a simple problem can turn into something more severe. If your child complains of tooth pain, don’t assume that it’s not a big deal and please don’t let it go. Call our pediatric dental office in Long Island as soon as you can. We can help you determine what’s causing the pain and get it fixed for a healthy, pain-free smile. Dentistry is important for everyone, especially kids. But why? Besides keeping smiles and mouths healthy with protective sealants, fluoride treatments and cleanings, those regular dental visits with your child’s Long Island pediatric dentist can set her on a path towards a lifetime of good oral and overall health. One of the common misconceptions about baby teeth is that since they’re going to fall out anyway, who cares when it actually happens. This is a particular concern for everyone at our Long Island pediatric dental office. Even though these precious, tiny teeth will fall out sooner or later, it’s important to keep them healthy so they don’t fall out too soon. At our pediatric dental office in Long Island, we stress the importance of visiting us at least every six months because we know how crucial early prevention can be. Many dental problems can be treated easily and successfully with early diagnosis, so seeing us regularly is crucial for even the tiniest grins. The second most common disease in the United States is tooth decay. The first is the common cold. Of course we all know that kids can easily catch a cold, but cavities? Sounds pretty far fetched. But guess what everyone at our Long Island pediatric dental office knows? Catching a cavity is totally possible — technically. While your child may not be able to catch the actual cavity, he can definitely exchange bacteria with another person, even you. 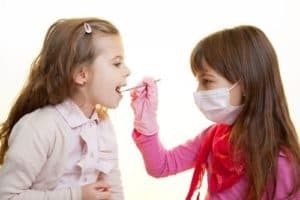 Kids have a habit of putting almost anything their mouths, and if any one of those things was previously in the mouth of someone who doesn’t have great oral hygiene, there’s a good chance germs are transferred from one mouth to another. Children and people with compromised immune systems are especially susceptible to infection and cavities from bad oral bacteria. But by keeping regular appointments with your child’s Long Island pediatric dentist, you can help protect that precious smile from the dangers of bacteria. If it’s more than six months since your child’s last visit to our Long Island pediatric dental office, it’s time to schedule an appointment. We won’t just get his smile sparkling clean with a professional cleaning, we’ll also check him out for any possible signs of decay. If we happen to find anything, there are several preventive measures we can take to further protect tiny teeth such as fluoride treatments and protective sealants. Don’t allow decay to take away from your little one’s grin, call us today to schedule an appointment. Serving patients from Long Island, Westbury, and all of Nassau County. We know dairy is a necessary part everyone’s diet, and we know it can even help ward off osteoporosis in older adults. But what about in kids? 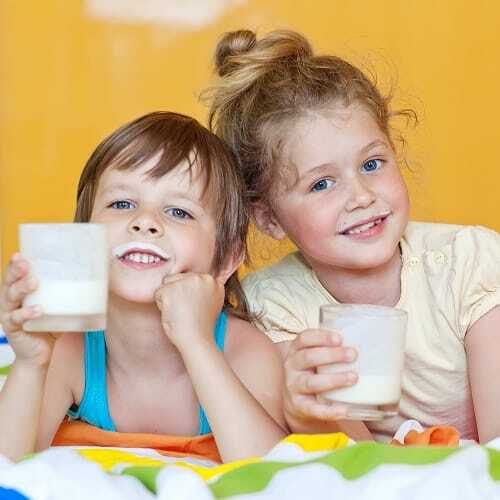 Dairy, and especially its calcium content, helps children build strong bones and yes, strong teeth. At our pediatric dental office in Long Island, we’d like to share a bit of information about how important dairy is for your kid’s smile. Even if your child is getting the recommended amount of calcium, it’s still incredibly necessary to maintain good oral hygiene habits. We recommend brushing twice a day and flossing once a day, everyday. 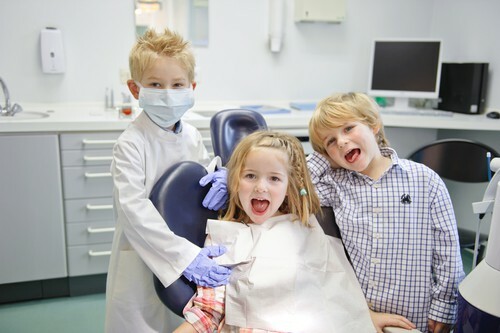 It’s also crucial for your child to visit a pediatric dentist in Long Island regularly. Appointments at least every six months allow your child’s teeth to be even more protected against decay and cavities through the use of fluoride, sealants, and professional cleanings. If it’s time for your little one to see a dentist, give our Long Island pediatric dental office a call to schedule an appointment today.